The devastated mother of a Japanese journalist held captive by the Islamic State has begged for her son's release. Militants affiliated with the group have warned the "countdown has begun" to kill two Japanese hostages. The online posting which appeared on Friday features a clock counting down to zero along with gruesome images of other hostages beheaded by the Islamic State militant group. Nippon Television Network first reported the message in Japan. 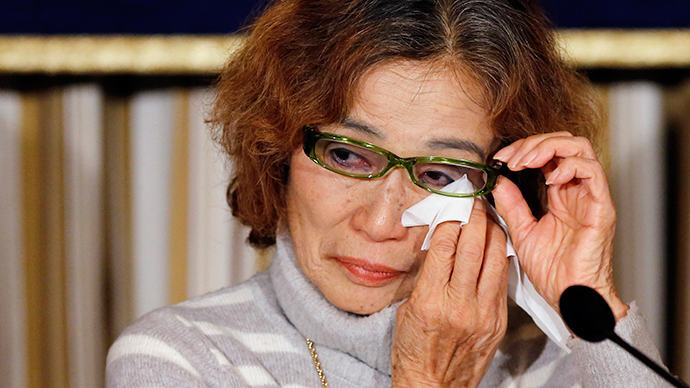 The devastated mother of a Japanese journalist held captive by the Islamic State has pleaded for her son's release. It came just hours before militants pledged to execute the man unless Tokyo pays a $200m ransom. Junko Ishido has called on the government to rescue her son, Kenji Goto, a 47-year-old war correspondent with experience in Middle East hot spots. He went to Syria in October to try to negotiate the release of his fellow captive Haruna Yukawa, a security consultant who was captured by the Islamic State (IS, formerly ISIS/ISIL) last August outside the Syrian city of Aleppo. The two Japanese men first met in Syria last April. “That’s how compassionate Kenji is, having always cared for his weak friends,” Ishido said. "If I could offer my life I would plead that my son be released, it would be a small sacrifice on my part," Goto's mother told a packed news conference on Friday, unable to hold back tears. She said her son had left his two-week-old baby behind to travel to Syria, because "he had to do everything in his power to save his friend and acquaintance." Mrs Goto voiced hopes that Prime Minister Shinzo Abe would follow in the footsteps of Prime Minister Takeo Fukuda, who paid a $6 million ransom to the Japanese Red Army radical group, whose members sought to overthrow the government, and hijacked a Japan Airlines flight en route from Tokyo to Paris in 1977. Fukuda came under intense fire, with many accusing him of caving in to terrorists. “To the people of the Japanese government, please save Kenji’s life,” Ishido said, speaking at the Foreign Correspondents’ Club of Japan in Tokyo, the Japan Times reported. In an online video released on Tuesday, a British-sounding militant is seen holding a knife while standing between Kenji Goto and Haruna Yukawa, threatening to kill them if Tokyo did not pay the Islamic State $200 million within 72 hours. The IS deadline for the ransom passed on Friday, with the fate of the captives currently unknown. Prior to the video's release, Japanese diplomats had told the families of the two captives that the government wouldn’t pay any ransom, Reuters reported, citing a source close to the matter. Abe told the government to make an all-out effort to secure the captives' safe release. "The government is continuing to work in unison to gather information and make every efforts for their release," Chief Cabinet Secretary Yoshihide Suga told a news conference, adding that the government is in an "extremely severe situation." Asked if Tokyo would pay the ransom, he said there's "no change to our stance that we will not give in to terrorism and will contribute to the international response to terrorism." Meanwhile, Tokyo's key mosque, the Tokyo Camii and Turkish Culture Center, has posted a statement calling for the prompt release of the hostages. It said the Islamic State's actions are "totally against Islam and have a serious impact on Muslim communities all over the world and put Muslims in a precarious position." "My son Kenji is not an enemy of the people of the Islamic faith," Junko Ishido said. "I can only pray as a mother for his release," she added.